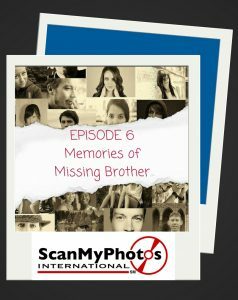 In this week’s episode, one ScanMyPhotos customer uses photo restoration to connect with her missing brother. Preview: Last year, we received an order to restore a badly damaged photo and found out there is so much more behind the two smiling faces in the picture. The photo was sent to us by ScanMyPhotos customer Fran Phoenix and when I asked her what made this picture so important, I was shocked to hear the answer. Welcome to this week’s bonus episode of Tales From the Pictures We Saved! In this week’s very special Tales from the Pictures We Saved episode we got to a golden opportunity to chat with professional organizer Andrew Mellen. Andrew’s prowess in the organization field has landed him on NPR, Real Simple, Oprah, Martha Stewart and many more high-profile media channels. He’s a larger-than-life organizational expert, speaker and best-selling author of the book Unstuff Your Life—and he’s on a mission to help everyone he meets get back in touch with their core values. Take a listen to the must-hear tips Andrew provided during our interview. In this week’s episode one ScanMyPhotos customer uses photo scanning to preserve both family memories and her Native American heritage. Preview: Before weekenders casually explored the ocean-side vistas of Santa Barbara and well before the Pacific Coast Highway carved its way through the Pacific Ocean’s shore, the Chumash Native Americans called the greater areas of Los Angeles, Ventura, San Luis Obispo, and Santa Barbara counties home.